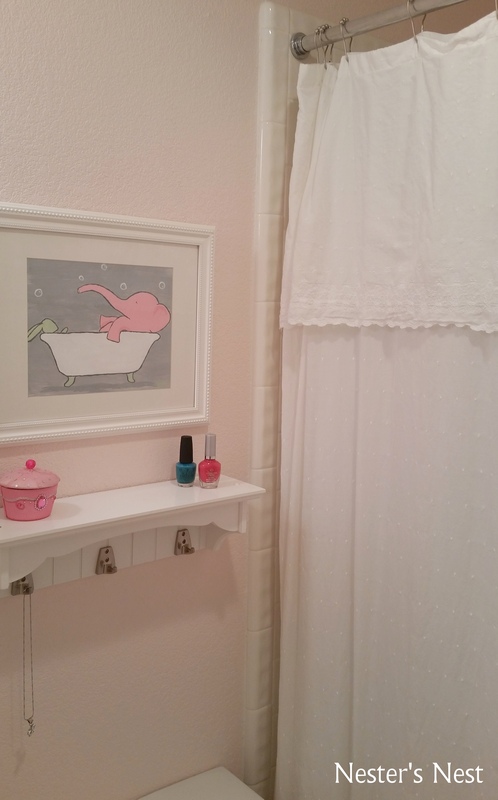 It’s been 4 years in the making, but my daughter’s budget-friendly bathroom is finally complete (for now). Why did it take 4 years? 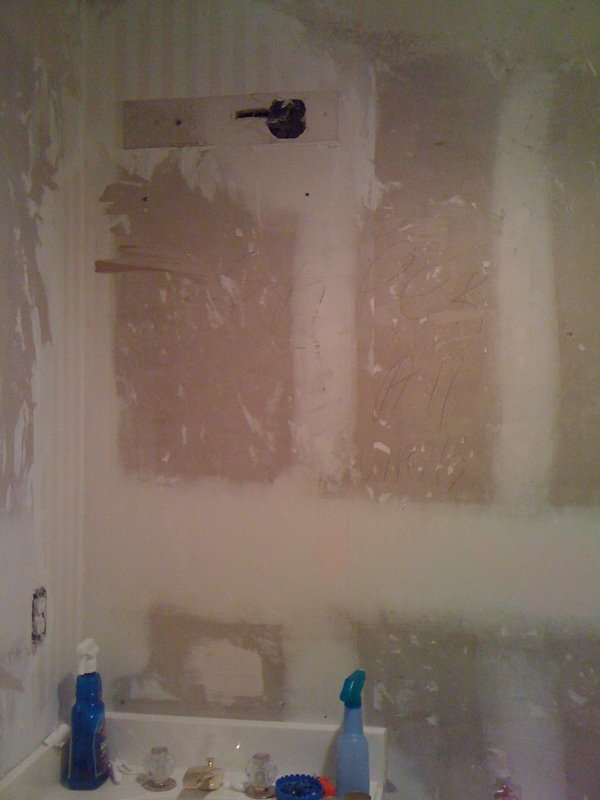 When we first moved in I tackled the major issues….dated wallpaper, a big, poofy shower curtain and brass, builder grade strip lighting….Oh, and cleaning. Lots and lots of cleaning (did I ever mention 2 teenaged boys used to live here?). Then, the bathroom facelift came to a stop. 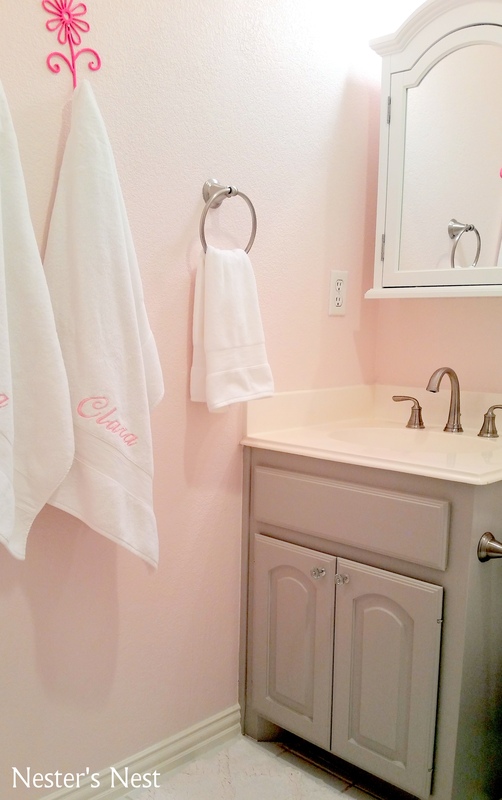 We still needed to replace the shiny brass faucets and something needed to be done to the drab white vanity, however, it quietly kept slipping down our list of priorities. Finally, I got tired of walking past a half-completed bathroom. Fast forward 4 years and it’s officially done. 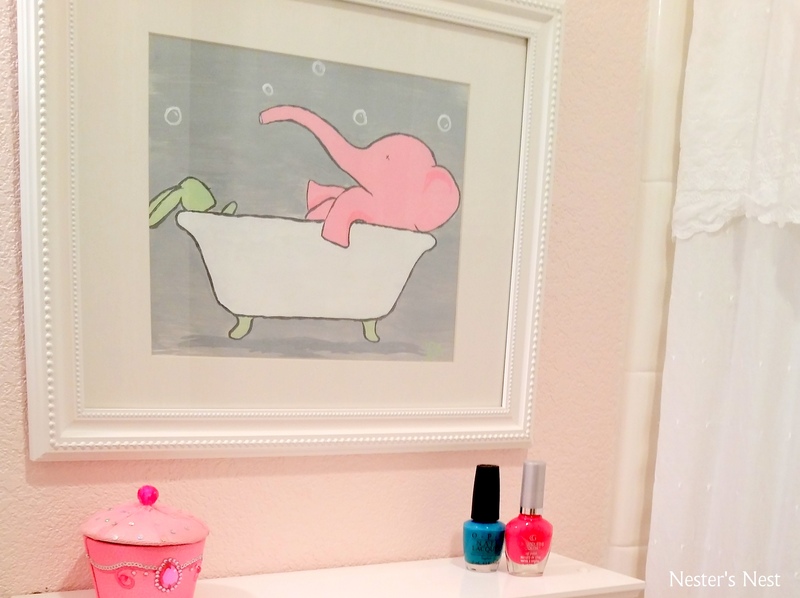 So, without further ado….here is the big reveal for this rather tiny bathroom. So much better and more appropriate for a little girl. 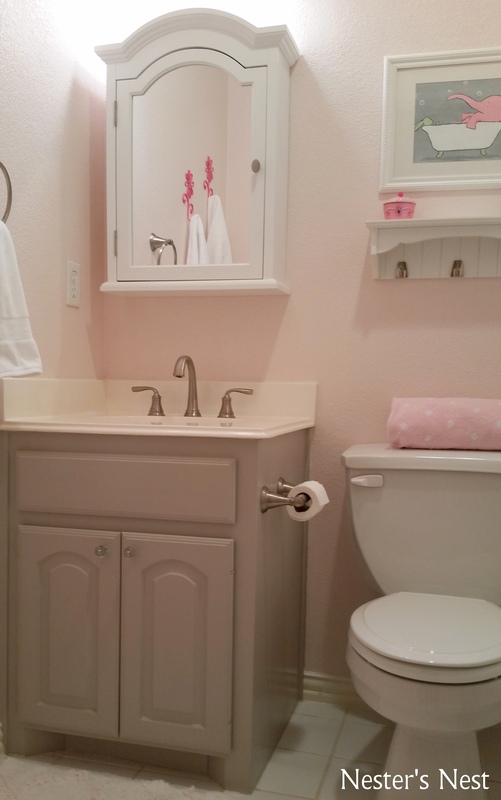 This bathroom only has about 3′ x 4.5′ of unused floor space, so it’s extremely cramped. 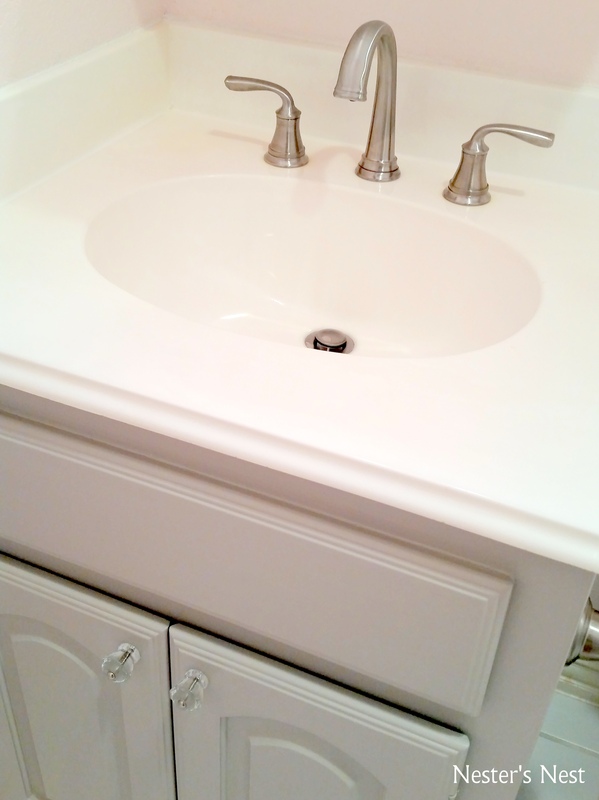 The vanity is just 24″ wide with no drawers and there are no windows, so storage and lighting were my biggest challenges. Do you see where someone wrote, “Paper all walls?” That makes me a little ragey. 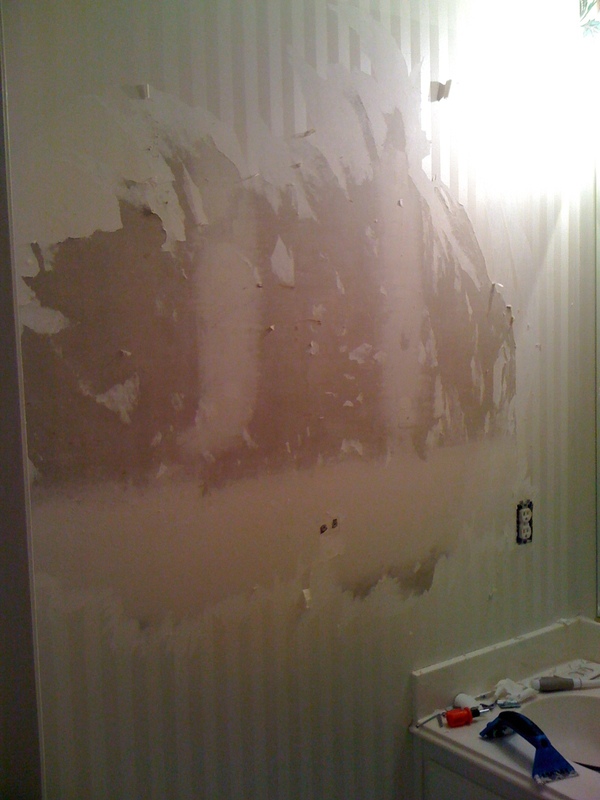 It took me almost a week before I got all of that nasty wallpaper off the walls. No matter what I did it would only come off in 2″ stips of torn paper. 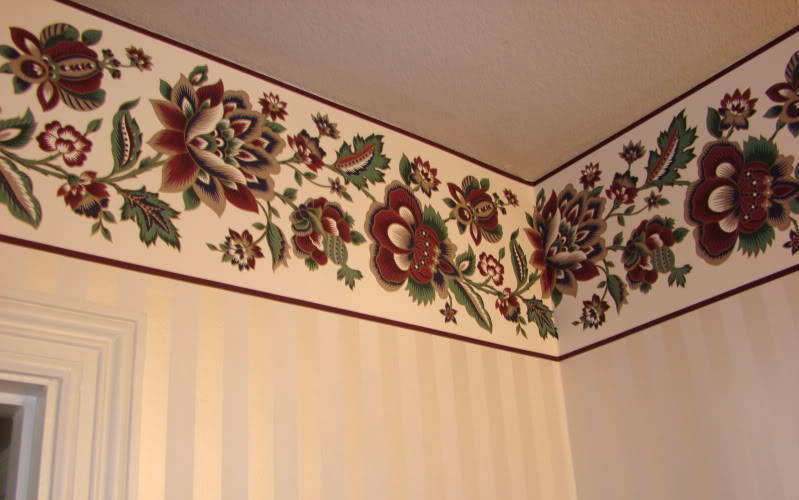 I don’t care how trendy, attractive or removable-friendly the newer adhesives are supposed to be…wallpaper will never go into my house again. Never ever. Never. 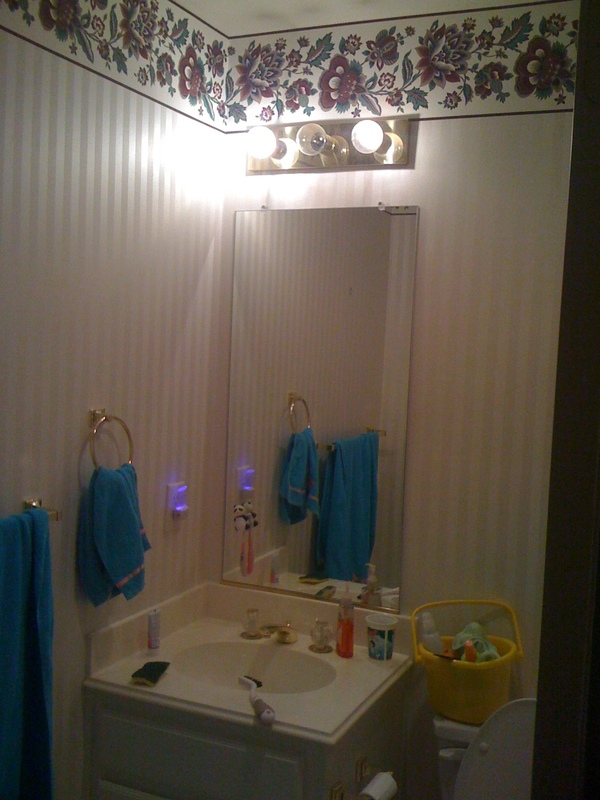 Once the wallpaper was FINALLY removed we textured the walls, replaced the vanity light and started painting. 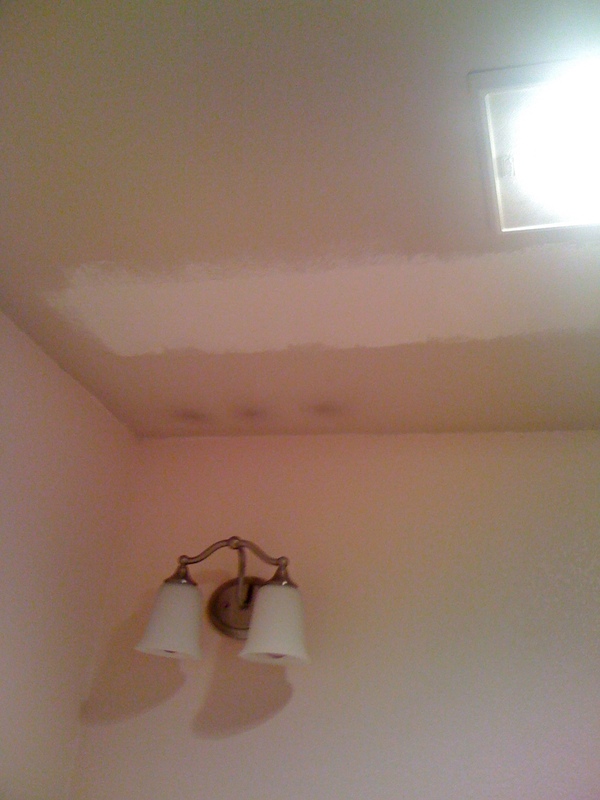 I still can’t get over how dingy the ceiling was….or the three BURN SPOTS created by the old vanity lights. 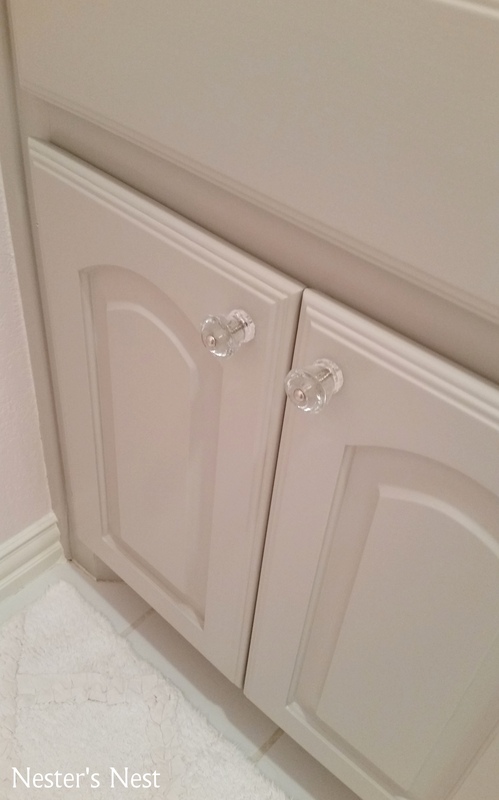 Since there are no drawers on the vanity a medicine cabinet was a necessity. I was so happy to have found this one on-line for a reasonable price. Those things aren’t cheap! To add a little contrast and depth I painted the vanity with some left-over paint I had on hand and followed up with 3 coats of polycrylic. 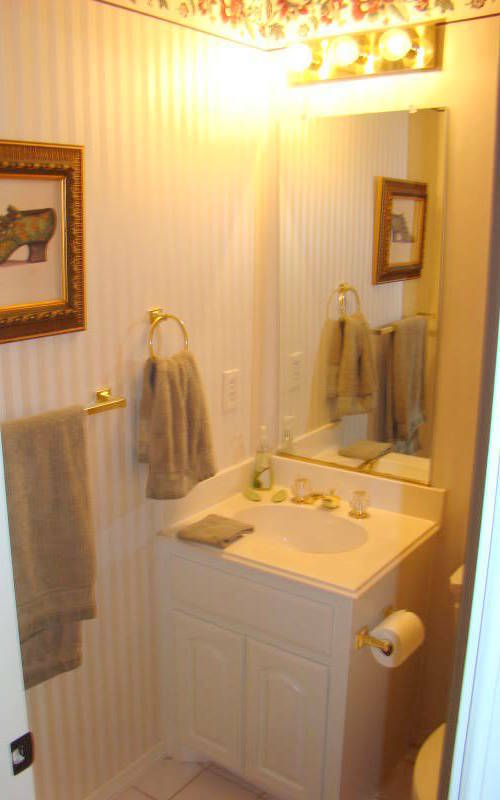 As I mentioned above, this is a tiny bathroom with very little storage so towel hooks were a must. I’m so bummed I don’t have a picture of the original shower curtain. The poofy burgandy, teal and hunter green custom shower curtain that came with the house was quite a showstopper. Trust me, simple white is better. My daughter has loved elephants since she was an infant, so a few years ago I painted this for her. It’s one of my favorites and adds a sublte touch of color. All in I think we spent about $350 with the bulk going toward the medicine cabinet and new faucets. Eventually, we would like to replace the vanity and all tile, but for now it’s perfectly fine. The room is light, airy and my daughter loves it. And that’s what counts the most. 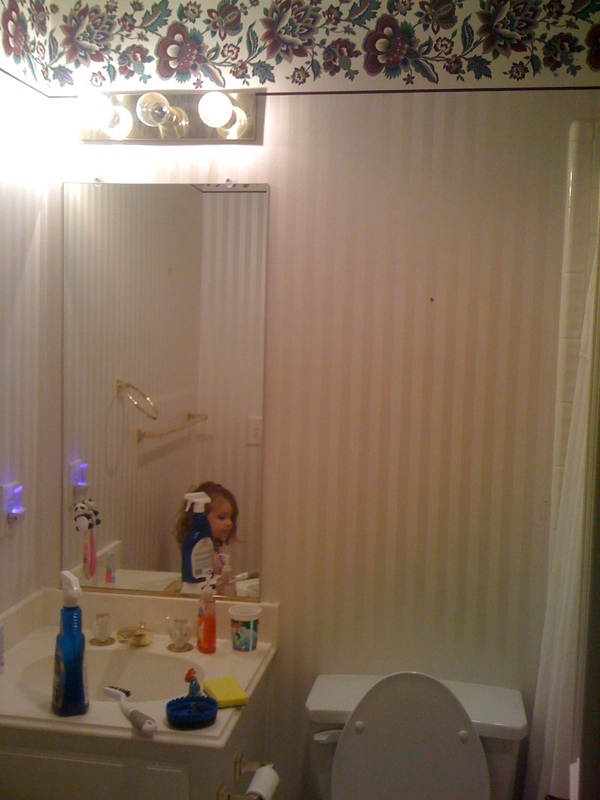 Wow, you really flipped that bathroom around! It looks GREAT!!! Nice work. Not sure if you tried it, but we had a remodel that was literally layered in wallpaper and I discovered the beauty that is a portable steamer. You can rent them at equipment rental stores. It seems like a lot of work to go get it, hook it up, and then all the wallpaper is gone fifteen minutes later, but you save days of work. It’s been fun to see your projects and progress. Thanks for sharing. Thanks, Elizabeth! I actually used a steamer. And that wallpaper was still a monster. I have to admit, I was impressed with it’s durability. It was a fight until the end…but I won! 🙂 Thanks for your compliment and for checking out my little blog!